I love stars. I’ve heard galactic astronomers say in the past, how stars are boring, and once you’ve seen one star you’ve seen them all. Personally, I couldn’t possibly disagree more. I could list a hundred reasons why stars are the most fascinatingly beautiful things in the universe. A star is an intricate and complex machine, each with it’s own individual quirks and peculiarities. And every now and again, those peculiarities turn out to be a little surprising. 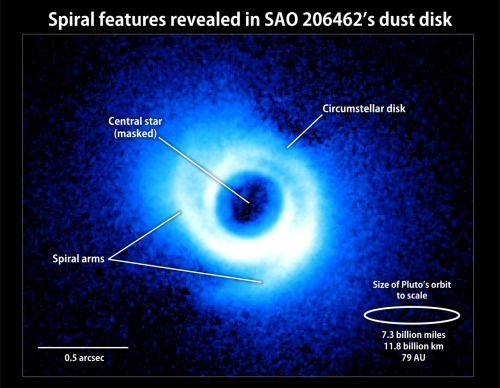 Enter SAO 206462, a star with spiral arms. Everyone knows that galaxies have spiral arms, but stars? Apparently so. Indeed, every news article makes a point of saying how surprised the astronomers working at the Subaru telescope were to discover this spirally little jewel. But… Wait a minute. We’ve seen spirals around stars before. Like LL Pegasi. And WR 104. In fact, technically this sort of thing should happen any time a star is shedding mass (for whatever reason) and it has a binary companion star. And Simbad lists SAO 206462 as being a star in a double system. So is this really that surprising? Well, for a start, it may be a binary, but its companion is far enough away to not be what’s causing the spiral. Secondly, I’ve never seen a star spiral with more than one arm before. Thirdly, this isn’t a mass-losing star. Actually, it’s quite a sun-like star, only much younger. If the hypothesis turns out to be correct, the cause of the spiral is really pretty cool. There’s a good chance that you’re looking at what happens as planets form. Seriously. How cool is that? What happens shortly after stars are born, is that a disk of leftover material hangs around the star like a ballerina’s dress. As the young star blows this material away into space, like steam off a hot coffee cup, planets coalesce. As their size and mass increase, these actively forming planets cut swathes through the disk of material. As the star blows the material outwards, the planets slice the disk into a spiral shape. So this picture may not be too dissimilar to what the Sun looked like about 4.2 billion years ago, when Jupiter and Saturn were freshly made! Of course, that’s only one hypothesis, and there are other non-planetary reasons why a spiral shape like this might happen. But it’s certainly the most compelling idea. Interestingly too, this star is described as “a solar-type star with a dusty, organically rich environment“. So potentially, both planet formation and organic chemistry. Perhaps this star may bear life of its own someday. A friendly nod to my source, the Daily Galaxy. More information available from the NASA press release. This entry was posted in Imported from Livejournal and tagged astrophysics, interstellar medium, planets, stars. Bookmark the permalink.